The Cabinet Secretary, Ministry of Health Kenya, Hon. Sicily Kariuki speaking during the 10th Ministerial Stakeholder Forum at Sarova PanAfric Hotel, Nairobi. The CS informed the attendees that through intensive stakeholder engagement and expert review, the independent panel of experts would be required to develop an action plan for the key objectives of the panel. The panel of experts will focus on legal and regulatory reforms towards transforming NHIF to be a strategic purchaser of health services in the context of UHC, organisational and business process re-engineering reforms aiming at repositioning NHIF as a national social health insurance provider and strengthening fiscal and social accountability and sustainability. The Ministry of Health (MOH) will continuously engage the media to keep stakeholders updated. During the forum, the CS reiterated that MOH would continue working together with the private sector especially in strategizing towards achieving the UHC. She challenged the private sector to ensure implementation of action points discussed while being sensitive to timelines. 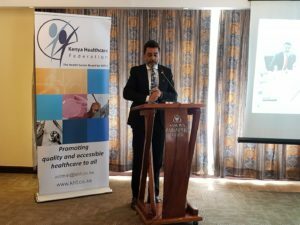 Dr. Amit N. Thakker, Chairman, Kenya Healthcare Federation speaking during the 10th Ministerial Stakeholder Forum at Sarova PanAfric Hotel, Nairobi. 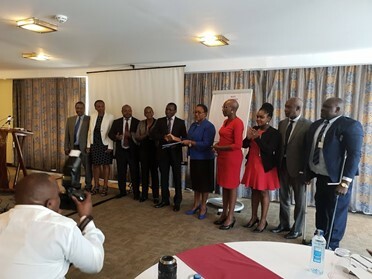 Dr. Amit N. Thakker congratulated the CS for inaugurating the NHIF Reforms Expert Panel noting the steps the MOH is taking toward reforms under the leadership of the CS. The KHF Chairman said, “The steps you have taken shows the public that you are serious about reforms. The 90 days timeline [for recommendations from the NHIF Reforms Expert Panel] will give good time to NHIF to make progress towards taking it the next level. It’s also great to hear that the same reforms process will be done for KEMSA”. Dr. Thakker advised the CS that the private sector would continue working with the pilot counties on three key focus areas. The first is the supply chain of medicines and non-medical health commodities where private sector will collaborate in ensuring that the supplies are available, affordable and of good quality. The products will include both locally produced and imported products. Secondly, the private sector will support in healthcare financing by expanding private medical insurance coverage to the pilot counties to complement UHC thereby enabling provision of wider coverage and higher quality of care. Lastly, on the matter of strengthening local referral systems, he informed the ministry that the private sector could help build local clinical capacity in the county referral hospitals effectively reducing the cases referred to Kenyatta National Hospital, Moi and Teaching Referral Hospital and other national referral hospitals. 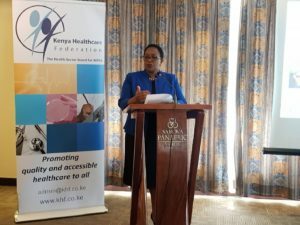 The KHF Chairman, Dr. Thakker, and the entire KHF fraternity congratulates our KHF director, Ms. Joyce Wanderi on her appointment into the NHIF Reforms Expert Panel by the Cabinet Secretary Health Hon. Sicily Kariuki. The Cabinet Secretary, Ministry of Health Kenya, Hon. 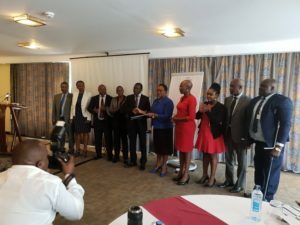 Sicily Kariuki congratulating the NHIF reforms expert panel at Sarova PanAfric Hotel in Nairobi.